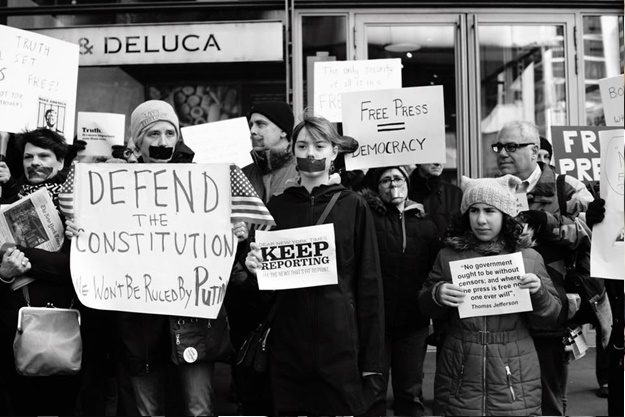 Yesterday morning, two days after Donald Trump’s White House barred major media organizations from its daily press briefing, members of Marxist-Humanist Initiative joined hundreds of other protesters in an emergency demonstration for freedom of the press. 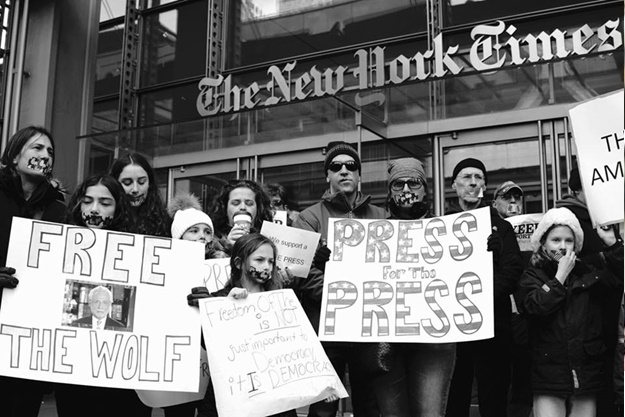 Protesters gathered at the offices of the New York Times, after which they marched to Fox News, the Wall Street Journal, NBC, and then back to the Times. Many demonstrators wore tape across their mouths. The demonstration was called by Get Organized BK!, a Resistance group in Brooklyn. The protest took place amid Donald Trump’s repeated denunciations of “fake news” media and the “lying press,” calling them the “enemy of the American people.” Steve Bannon, his white-nationalist security adviser, has made similar comments. 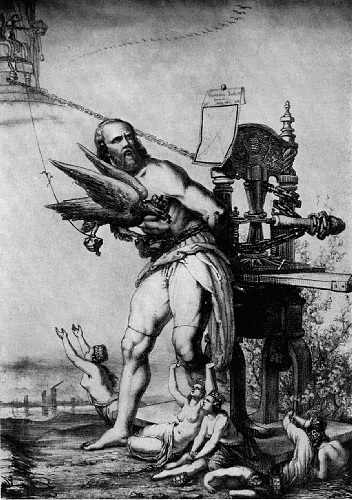 “Lying press” is a direct translation of lügenpresse, a term used by the Nazi regime in Germany to discredit the news media. The Trumpites are fearful of news media investigations into their ties to Vladimir Putin’s authoritarian regime in Russia, as well as their investigations into the Putin regime’s hacking of Democratic National Committee e-mail in its effort to elect Trump as U.S. President. The publications barred from the press briefing include the New York Times, the Los Angeles Times, CNN, and Politico, which have been forcefully investigating and reporting on these stories. In solidarity with these publications, the Associated Press chose not to participate in the press briefing. During the election campaign, Trump lavished praise on Wikileaks, which has refused to disclose the source of the Democratic National Committee e-mail it published. Now, however, he proposes that publications be forbidden from citing anonymous sources in their new stories. Trump clearly does not want to end his life in prison, as a senior U.S. intelligence official has predicted he will. 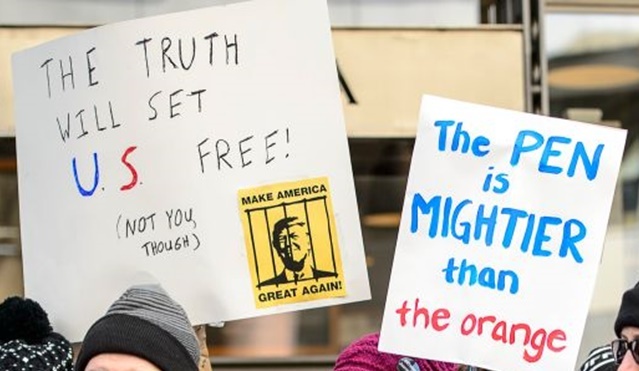 However, other people, such as a protester at yesterday’s demonstration who carried a sign depicting Trump behind bars, would welcome his incarceration. Fans of Wikileaks and Julian Assange seem to be absent from the front ranks of the fightback against the Trumpites’ attacks on freedom of the press. In marked contrast, they vociferously hailed the hacking and publication of Democratic National Committee e-mail. Some liberals, such as Josh Marshall, are trying to depict the Trumpite attack on freedom of the press as antithetical to “American values.” Yet if Marshall is right, how can one explain the fact that Trump thinks he can benefit by attacking the fact-based media as the “enemy of the American people”? In fact, two different Americas are at war. Trump is appealing to his base. Its “values” are authoritarian, and it is unconcerned with or even hostile to freedoms and civil liberties for those who think differently. Along with “fake news,” we need an additional term: fake theory. 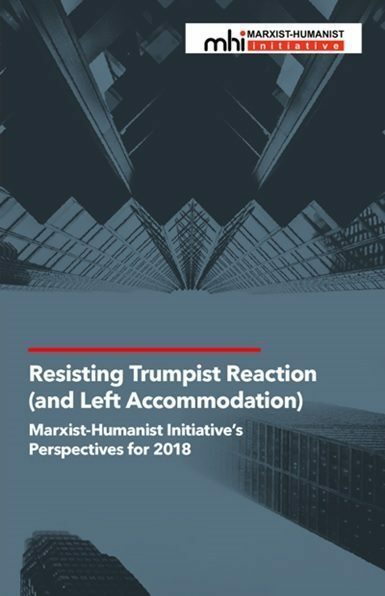 If Trump succeeds in limiting the freedom of the major news media, then Marxist-Humanist Initiative has no hope of keeping its website online. We cannot count on any part of the U.S. government to rescue us. It did not force Trump to repudiate his vile response to the white-supremacist violence in Charlottesville. Our real hope lies with the Resistance that can bring Trump down.